The last decade has been rough for a key reservoir in the intricate water storage system that sustains much of the American Southwest. 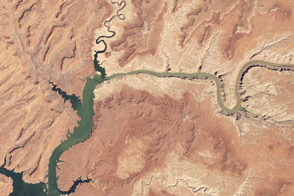 Lake Powell, a meandering network of flooded canyons in southern Utah, has seen inflow rates from its key tributaries dwindle due to severe drought. Inflow between 2000 and 2012 has been the lowest 13-year period on record since the lake was created in 1963. A welcome surge of water arrived in 2011, but 2012 was a near-record dry year. And 2013 isn’t looking much better. Meteorologists expect another dry year, and hydrologists are forecasting that the combined inflow of 2012 and 2013 will be the second lowest on record (trailing only 2001-2002). In early May 2013, the lake was 47 percent full. 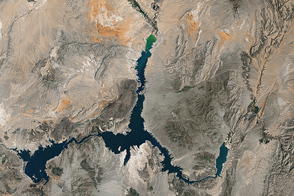 That is not a record low—the reservoir dipped to 33 percent of capacity in 2005—but U.S. Bureau of Reclamation forecasters expect Lake Powell to drop to 42 percent of capacity by September, the end of the water year. 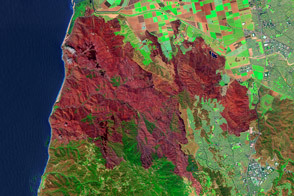 The image above was acquired by the Advanced Land Imager (ALI) on NASA’s Earth-Observing-1 satellite on April 26, 2013. During normal years, the canyons would be filled with blue-green Colorado River water. Instead, only a thin stream of water winds its way through a thick layer of sediment on its way into the shrinking reservoir. Water levels were low enough that you could see features of the canyon floor that are normally underwater. A thin, pale “bathtub ring” was visible on freshly-exposed canyon walls. 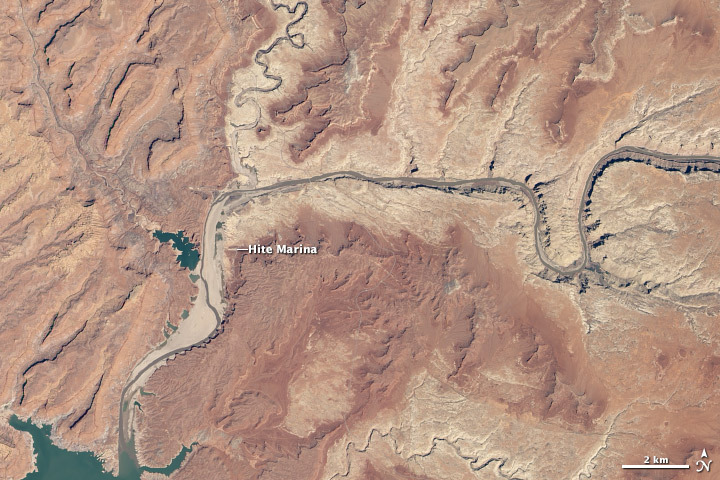 Hite Marina appeared completely dry from space. A round of late-spring snowstorms in 2013 offered a rare bit of positive news for reservoir watchers. Two of the three key river basins that feed Lake Powell—the Green River and the Upper Colorado River—saw much higher levels of precipitation in April than normal. The extra rain and snow provided critical relief for farmers, but hydrologists say that the precipitation was still too little to have much impact on the reservoir. Snowpack peaked at 81 percent of average total accumulation in the Upper Colorado and Green, noted U.S. Bureau of Reclamation hydrologist Katrina Grantz. But the resulting runoff is likely to be only 45 percent of average because the parched soil is expected to absorb much of it. Some of the smaller reservoirs north of Lake Powell will get a boost, but Grantz expects Lake Powell to increase by only a few feet this spring and summer. Normal inflow from spring runoff, in comparison, would cause lake levels to rise by about 40 feet (12 meters). 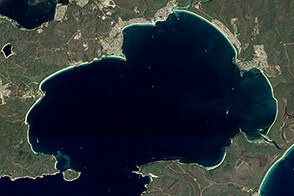 NASA Earth Observatory image by Jesse Allen and Robert Simmon, using ALI data from the NASA EO-1 team. Caption by Adam Voiland, with information from Katrina Grantz (U.S. Bureau of Reclamation), Michelle Stokes (National Oceanic and Atmospheric Administration), and Julander Randall (United States Department of Agriculture). The last decade has been rough for the reservoir at the heart of the intricate water storage system that sustains the American Southwest. 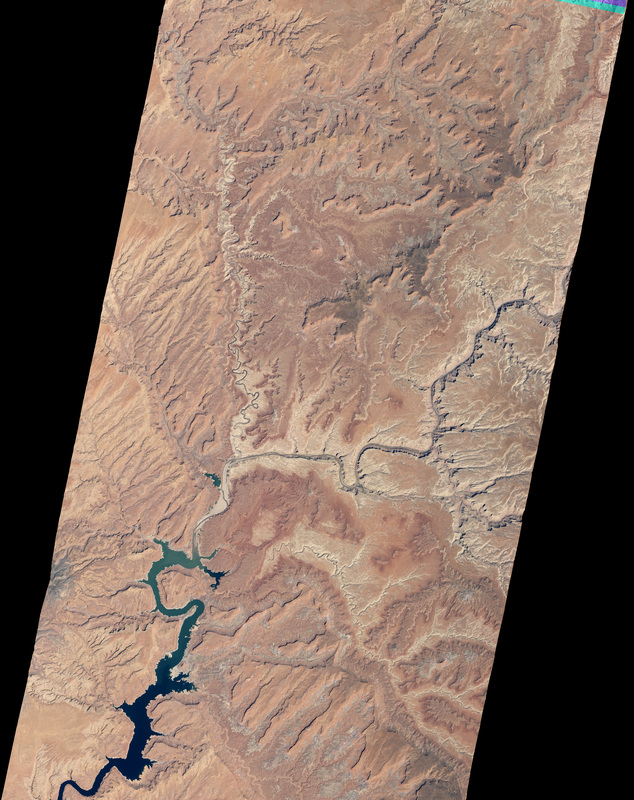 Earth Observatory (2013, April 26) Water Level in Lake Powell. NOAA (2012, June 1) Lake Powell Water Supply Outlook. Accessed May 9, 2013. NOAA Colorado Basin River Forecast Center (2013, May 1) Water Supply Forecast Discussion. Accessed May 9, 2013. U.S. Department of Interior. Lake Powell. Accessed May 9, 2013.